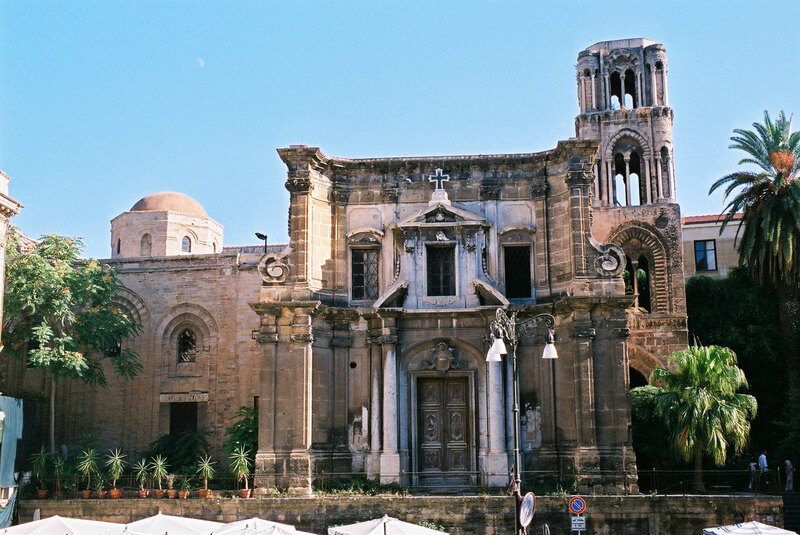 The Church of Santa Maria dell’Ammiraglio, seat of the parish of San Nicolò dei Greci (the chapel of St. Kollit Arbëreshëvet in Albanian), note like Martorana, is located in the historical center of Palermo. Adjacent to the church of San Cataldo, it overlooks Piazza Bellini where the church of Santa Caterina d’Alessandria faces. The Church belongs to the Eparchy of Piana degli Albanesi, a constituency of the Italian-Albanian Church, and follows the liturgy for the Italian-Albanian residents of the city according to the Byzantine rite. Byzantine Byzantine building of the Middle Ages, is a witness to the religious and artistic culture still present in Italy today, further brought by the exiles of Albanians refugeed in Sicily under the burden of Turkish persecution in the Balkans. Since July 3, 2015, it is part of the World Heritage Site (UNESCO) under the “Arab-Norman Itinerary of Palermo, Cefalù and Monreale”.